Create a luxury wedding suite with all the beautiful details. 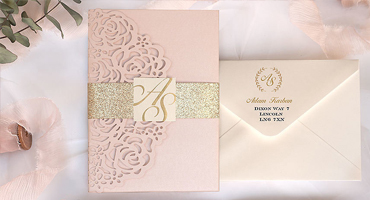 Browse our luxury wedding invitation collection to find the design that fits your style. Foil-pressed cards make your wedding invites truly shine. Personalized foil invitations are eye-catching special touch that will certainly impress everyone who receives a card. The laser cutting makes our invitation cards look cutting-edge. Laser cut wedding cards feature unique, fresh and eye-popping look that are sure to "wow" your guests. 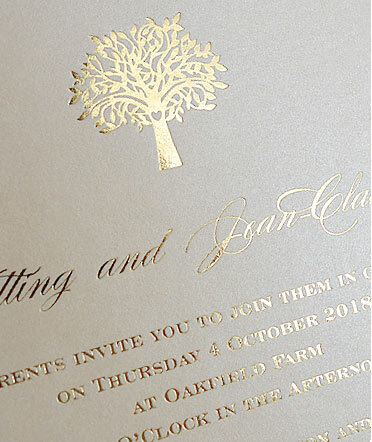 Embossed wedding cards exude fine craftsmanship creating a distinct, textured aesthetics. The eye-catching relief will turn your cards into heirloom mementos to be treasured for years. Polina Perri web store brings to your attention luxury wedding invitations supplemented with elegant stationery. Browsing our collections, you will definitely find the card of your dream whatever it is: a luxurious or a classical design, a whimsical or a traditional one, a vintage-inspired or with a modern twist. One of the most spectacular ideas, embodied by Polina Perri experts are wedding invitation suites: absolutely irresistible all-in-one solution for your special day. Opening a refined shimmery box, you'll reveal a flawless wedding card, wrapped in the semitransparent tissue paper as a precious gift. The invite, printed with the graceful calligraphy, contains all the details of the forthcoming celebration. Inside the invitation, you will find the corresponding reply card with a return envelope. 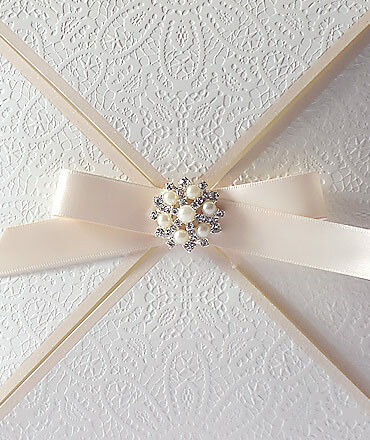 The design box can be either tied with a satin ribbon or decorated with a customizable paper belt. It is also possible to stamp your wedding monogram directly on the lid of the box. All details of the kit bundled together provide ultra-modern & charming look. 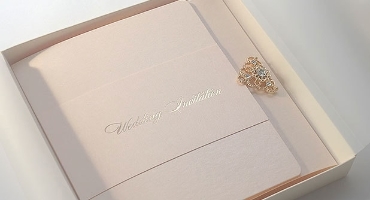 So make a statement for your Big Day by selecting these fascinated elegant wedding invitations! Polina Perri's internal policy is aimed at establishing trusting relationships with our Customers. Our major priority is to provide you with maximum comfort at all stages of cooperation. Therefore, all our efforts are exerted to offer you the excellent service together with the premium products so that the wedding planning becomes for you a creative, totally stress-free experience. We highly appreciate our returning Customers and happy to offer them an exclusive 10% Loyalty Discount. The benefit of this discount is applicable to those Customers, who ordered our luxury wedding invitations with us and is going to place an order for a corresponding wedding stationery such as table number and place cards, wedding menus, Order of Service brochures, the seating plan etc. If you placed an order with Polina Perri and your family members or friends love the wedding stationery we produce, with the help of your recommendations they can obtain a Special Discount while placing their order with us. Polina Perri aspires to find a personal approach to each Customer. Therefore, we grant you flexible and fair discount options on the stationery market. Polina Perri design studio gives the Customers an opportunity to preview the stationery they intend to order. You can examine the cardstock quality and add a personal touch choosing the calligraphy, layout, and colors for your wording. How to get such a preview? Just like that - order a personalized sample with us! It is an easy yet creative option for our Customers. Once you've determined your preference in terms of the invitation design, you order the sample of this card directly through our website. By default, the samples are pre-printed with random designs. To get the personalized sample, you need to email us your wording together with the preferable font style and colors for the text. If you want to add the color accents to the bride and groom's names, the hosts' or guests names etc., include this information into your request. We will make an electron proof of your card and email it to you for confirmation within 24 working hours after the order is placed. As soon as you confirm the electronic mock-up, the actual sample of the card will be printed and dispatched to you. In a few days, you will get a personalized copy of the card! That will facilitate the introduction of any changes/corrections and give you an opportunity to preview the card before placing the bulk order. So do not miss this exceptional offer! Pocketfold wedding invitations without exaggeration can be called bestsellers of Polina Perri luxury collection, immensely loved by the customers. These are sophisticated cards with exquisite brooches, elegant bow and ribbon decor, refined embossments, design paper appliqués, and natural lace. The advantage of pocketfold format makes these luxury wedding invitations not only stunningly chic but very functional as well – the pocket of the invitation can fit up to four additional information inserts. Each range of pocketfold invitations – Virginia, Regina, Sophie, Madeline, Diamond & Veil, Infinity, Vivaldi – is represented in several popular colors and can be supplied with the matching exclusive stationery. Our pocketfold cards with unique design сoncepts would definitely impress and fascinate your guests. Polina Perri design studio is happy to introduce the opulent invites made with the help of state-of-the-art technology of laser cutting. This production technology has already gained the highest appraisal of designers and manufacturers and received great acclaim from customers. 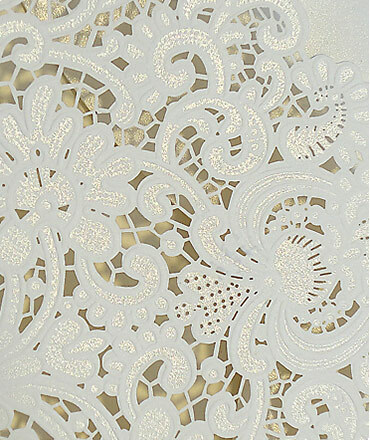 All because laser cut wedding invites feature the filigree charm of the paper lace. The openwork pattern is scrupulously rendered so that touching it you feel the texture of lace, not paper. Laser cut invitations, reminding an airy wedding gown, seamlessly combine timeless aesthetics with modern technologies to create an ultimate vibe of your special event.